Traders now have direct market access (DMA) to stocks listed on the New York Stock Exchange, NASDAQ and the American Stock Exchange. — Integrating real equities onto MetaTrader 5 gives Tradeview a major competitive advantage and truly differentiates us from all other FX brokers. We aimed to give Tradeview clients the best and most complete trading experience and integrating equities onto this particular FX platform accomplishes that goal, says Tim Furey, CEO of Tradeview LTD.
Over the past year, Tradeview made a major breakthrough by developing technology to be compatible with the MetaTrader 5 platform. The infrastructure investment includes co-location of servers on the NY4 data center, low latency driven solutions, superior smart order routing, ultra-fast fiber-optic cables and connectivity to all major exchanges. In addition, Tradeview coded and programmed its own order entry box which distinguishes between easy-to borrow and hard-to-borrow stocks when executing short orders. — Our custom order entry box, along with Tradeview’s overall infrastructure and technology expenditure is a testament to our commitment to ensure that traders receive the best execution for their orders so client’s trading profits are maximized, says Mr. Furey. Moreover, Tradeview partnered with a FINRA member to obtain the best prime brokerage clearing solution on behalf of its clients. This partnership is a key component for Tradeview’s access to the US equity markets and provides record-keeping and escrow services for trader’s positions. For more information on Tradeview’s on-exchange equity offering on MetaTrader 5, please visit https://www.tvmarkets.com and https://www.tradeviewforex.com/. The new release of the MetaTrader 5 platform features support for deals involving instruments with a minimum volume of 0.00000001 lots. We have added the ability to display volumes with an accuracy of 8 decimal places in the market depth, in the time and sales, as well as in other interface elements. The minimum volume and its step change are dependent on the financial instrument settings on the broker's side. The built-in chats have also been re-worked in this build — now the the chats support group dialogs and channels. Traders can now discuss trading ideas in group chats, create their own channels with interesting content and read the channel posts from other users. Furthermore, they are able to communicate with their broker's support team if it has a corporate MQL5 account. All these new exciting features turn the trading and analytical platform into a powerful communication hub. Traders using multiple monitors will appreciate the functionality of moving financial instrument charts outside the platform window. From now on, they will be able to set the main platform window on the primary monitor to control their account, and move their charts to the secondary monitor to observe the market situation. Find out more about all the new innovations in the "Release notes" section. Launch the latest MetaTrader 5 version and try out its new features. The forex broker FXOpen has offered their clients access to ECN trading and interbank liquidity via MetaQuotes Software's new platform. This is the company's next strategic step of continuous investment in trading technology. FXOpen launched the brokerage service back in 2005. Currently, the company hosts and serves more than 200,000 active accounts, while the traded volume is over $65 billion, flowing through the company's platforms on a monthly basis. The FXOpen ECN model provides traders the real access to interbank trading: the system directly links different market participants, such as private investors, banks and centralized exchanges. Mr Denis Peganov, CEO of FXOpen Markets Limited, comments, "We are proud of the market leading trading experience we offer to our clients. FXOpen has been on the forefront of trading innovation through MetaTrader, being the first to offer the MetaTrader 4 ECN bridge and Islamic accounts. At the same time, we have always been careful not to introduce new products, unless we are absolutely certain they meet client demands. Currently, we are happy to launch the most advanced online trading platform MetaTrader 5, which incorporates all the necessary features for successful trading in financial markets." A steady trend has formed in the Australian market, with more local brokers switching to MetaTrader 5. Another large player, FP Markets, has added the multi-asset platform to its offering of existing trading solutions. FP Markets is an ASIC-regulated Forex broker with over 13 years of experience in the industry. The new platform enables the company to offer superior tools for comprehensive price analysis, extensive use of trading robots and copy trading functionality to their clients. Mr Matt Murphie, Managing Director at FP Markets, commented, "We have a history of investing heavily in technology and our clients can be confident that our technology offering is second to none. The new platform is the evolution of MetaTrader 4, which is already regarded as the go-to platform for traders globally and is designed to take the trading experience to a whole new level." We will showcase our latest MetaTrader 5 developments at the Finance Magnates London Summit 2018. This year, the fintech event will be held at the Old Billingsgate Market, between November 13-14. This is Europe's largest B2B conference for the financial industry community, dedicated to trading, investments and capital markets. We will present the latest developments for the MetaTrader 5 multi-asset platform, including the optimized client management system and advanced analytical features in the back office functionality. We invite everyone to visit our workshop "MetaTrader 5: Automated client management and marketing analytics" on November 14th at 14:00. Another Australian broker now provides the ability to its clients to trade via MetaTrader 5. GO Markets customers have access to the desktop, mobile and web platform versions. The ASIC-regulated company based in Melbourne is one of the pioneers of online trading in Australia providing brokerage services in the international financial markets since 2006. — MetaTrader 5 possesses true multi-asset capabilities and a highly configurable back-office, which is essential for our future expansion plans and strategic goals. The launch of a new product from MetaQuotes is a clear win for my team and our clients. The largest store of ready-made applications for algo-trading now features 13,970 products. This includes 4,800 robots, 6,500 indicators, 2,400 utilities and other solutions. Almost half of the applications (6,000) are available for rent. Also, a quarter of the total number of products (3,800) can be downloaded for free. MetaTrader Market is the only official online store of trading robots for MetaTrader platforms. Any trader will definitely find the desired application among the thousands of trend and countertrend Expert Advisors, scalping tools, neural network robots and martingale systems. The Market is a single trading robot and indicator selling point, known to every trader. Integration with the MetaTrader platforms: an application can be purchased and launched straight from the trading terminal. Support for popular payment systems, including PayPal, WebMoney and ePayments. In addition, traders can pay for the purchased application using MQL5 coupons provided by brokers. Secure purchasing procedure: every purchase is protected by a unique installation code and can work only on the buyer's PC. The ability to download and test trading robots before purchasing. Every product featured in the Market is provided with a demo version, which enables pre-purchase testing in the Strategy Tester and evaluation of application performance on historical data. Visit the Market and choose a ready-made solution for your specific trading style! Almost a thousand web resources around the world feature the Economic Calendar widget. Among them are brokerage websites, popular financial media, analytical portals and trader blogs. The service allows sorting of macroeconomic events by their importance, country and time interval, while being legally burden-free — you do not have to worry about licensing risks. It is available in the 9 most popular languages. It is updated immediately after events appear in a source. It is expanding — new countries and languages are added regularly. Quick installation in a couple of clicks. The widget provides websites with a detailed release schedule of 500 indicators and indices, of the world's largest economies. Thus, traders quickly receive up-to-date information on all important events with explanations and graphs in addition to the main website content. The MetaQuotes offer is valid for owners and webmasters of any resource. To add the Calendar, just click the "Add to website" button on the service web page. After specifying a width/height and a display period, the code is generated for you. Copy and paste it into a relevant web page of your preference. Now your visitors can have a ready-made tool for monitoring financial news. The international broker has expanded its MetaTrader 5 offering. Company clients can now have access to 177 new ETFs on the Admiral.Invest account. ETFs are investment funds traded in an exchange, much like stocks. Any ETF is an asset portfolio that tracks an index and is traded as a single security. An ETF share price follows the index it was created to copy. Admiral Markets offering currently covers over 30 ETF categories including equity blends related to different regions, capitalization levels and industry segments, as well as ETFs tracking indices, commodities, agriculture, currencies and fixed income instruments. Mr. Jens Chrzanowski, a Member of the Admiral Markets Group Management Board, "Such an expansion of our product line has become feasible only after the launch of MetaTrader 5. The new platform is extremely versatile having an ability to accommodate almost an unlimited number of instruments. The addition of 177 new ETFs is just one more step towards the expansion of the suite of trading instruments available to our clients, with more to follow." Clients of the company can now trade in mobile and desktop versions of the MetaTrader 5 multi-asset platform. This new offering from EightCap also includes a web trader. EightCap clients gain access to 38 technical indicators, 21 timeframes, additional markets and the new economic calendar directly in the platform. The list of trading instruments supported by EightCap exceeds 200 products: global indices, metals, oil, along with major and minor currency pairs. "We are committed to providing our clients with a market leading trading experience", say Joel Murphy and Nadia Feng, EightCap Executive Management. "Our clients need access to the very best tools and technology in the industry and we’ll continue to invest in these needs. Our recent introduction of MetaTrader 5 is an exciting step forward for us in this space". With MetaTrader 5 now live, EightCap is looking at new exciting products and financial instruments to extend to their clients in coming months. The launch of the new platform reflects the broker's goals — developing through the use of cutting-edge system solutions and high-quality customer service. HotForex team believes that MetaTrader 5 will suit the needs of traders who wish to master financial markets regardless of their trading style or preferred trading assets. "We are aware that every trader is different, and we are always looking to ensure that our clients have the necessary tools to trade according to their preferred style, using the device of their choice", — says Mr George Koumandaris, CEO of HotForex. "Providing the MetaTrader 5 platform is the perfect extra boost that our clients need in order to enjoy even more trading possibilities. We are demonstrating that HotForex will continue offering the best possible trading solutions on the market". Standard accounts are suitable for all types of trading strategies and provide access to financial markets with any deposit. ECN accounts are designed for professional traders, who prefer market execution of orders, sent directly to the liquidity providers. The extended set of minute and hour timeframes. It is possible to monitor price fluctuation at a wider time range using М2-3-4-6-10-12-20 and Н2-3-6-8-12 timeframes. One-click trading option in the Market Watch window. The built-in economic calendar features upcoming events marked in accordance with their significance. Also, press conferences and news releases schedule is now displayed in the chart of the corresponding instrument. The number of indicators and graphical objects for technical analysis has been increased. The strategy tester is multi-threaded, allowing for expert advisors optimization within a matter of hours. "For over 10 consecutive years, AMarkets has been focusing on providing easy and flexible trading services to its clients. Keeping up to date with the latest top-tier technologies, we closely monitor all market trends and introduce only the best trading solutions. MetaTrader 5 is one of them. It was an inevitable step towards a better and more efficient service provision to both our clients and partners”, comments Mr Nikolai Gusev, Chief Dealer. Chinese-speaking brokers and integrators can now access all necessary information in their native language. MetaTrader 5 is gaining momentum in East Asia: over a million traders and hundreds of brokers from China, Hong Kong and Singapore already use various versions of the trading platform. 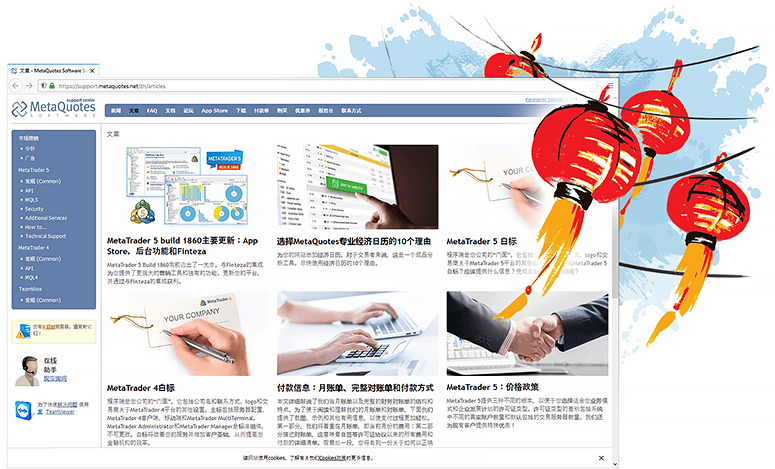 The launch of the Chinese support website version, in addition to the English and Russian versions, is directly related with the expansion of MetaQuotes' presence in the Asian continent. The Technical Support Center provides unique information which cannot be found in other resources. In addition to a huge knowledge base and professional marketing materials, the website features the App Store of verified MetaTrader 5 solutions for brokerages. Documentation on Manager and Administrator terminals, multi-page FAQ sections with answers to critical questions and exclusive guides on back-office analytics and onboarding functionality are available only via the Support Center website. The entire website interface has been translated into Chinese. Moreover, we will continue to further develop both the database and the interface, in an effort to sustain and increase the brokers operational efficiency. The user interface of MetaTrader Manager and Administrator terminals is also available in Chinese. Furthermore, we plan to introduce an updated website design and launch new projects, which will help MetaTrader brokers in further increasing their business expansion and continuity, from both a technological and a marketing point of view. The international broker offers its customers trading via the fifth generation platform developed by MetaQuotes Software. Exness broker strives to provide traders with the best trading conditions, realizing their professional potential. The total trading volume of the Exness Group in 2017 comprised over 3.2 trillion USD, while the average monthly turnover exceeded 270 billion USD. The number of active clients as at May 2018 was more than 46 000. Unprecedented reliability and execution speeds due to the use of the MetaTrader 5 architectural capabilities. — The launch of MetaTrader 5 is a clear signal of intent that we will continue to provide the very best in trading opportunities and experiences to our global community of traders, — says Mr Petr Valov, CEO of Exness. — We are proud of the great relationship we have with MetaQuotes Software, and are excited to see our traders enjoy the new platform's extended capabilities. The Cyprus-based developer of Call Center software is entering the growing market of institutional solutions for MetaTrader 5. Antelope's CRM, Tracking and VOIP systems are combined into one smart interface, enabling brokers to have instant access to all the information required in maximizing their ROI. The comprehensive suite of Antelope Systems' tools are designed to increase efficiency and improve sales effectiveness through algorithmically automated processes, which reduce both manual labor and human decision making. Antelope Systems' solutions include the 360 degree CRM, Ninja Lead Distribution software and Affiliate Management System. You can request Antelope applications from our App Store of ready-made brokerage plug-ins for MetaTrader 5. "This positive and important step provides to Antelope Systems and to our clients a better all round experience" commented Mr Ori Hazan, the integration company's CEO. "Understanding that every call center operates in the golden triangle of marketing, lead management and phone systems, we have unified all into one optimized package for MetaTrader 5. Brokers operating in the new platform will soon be able to order our products in the MetaTrader 5 App Store — with the new marketplace, it has become much easier to find and integrate the desired solutions." In March 2018, the British broker added MetaTrader 5 to its platform offering, and later in May launched DJIA stocks trading via this platform. Having noticed a growing interest in this new offer from traders, Darwinex decided to launch the "hedge-fund as a service" model from MetaTrader 4 to MetaTrader 5. Under this innovative model, traders perform trading operations on their brokerage account as normal while Darwinex quotes their strategy into the DARWIN investable asset. The risk is standardized and managed by Darwinex itself. A separate risk management layer protects the investor and enables an apple-to-apple comparison across trading strategies. Mr Juan Colón, CEO of Darwinex, said, "Since adding the MetaTrader 5 platform to our brokerage offering, we have seen considerable interest from traders around the world. Extending our 'hedge fund as a service' model to additional platforms and asset classes was the logical step forward. The launch of new services for MetaTrader 5 traders is in line with our policy towards achieving the status of the leading innovative broker." We have added calculation for the price history of synthetic symbols for the entire available data depth. Previously, the history was only calculated for the last two months. A deeper history could be created only upon an explicit request (when scrolling the chart to the left or calling Copy functions). In this case, the history of the synthetic symbol will be calculated for a period from June 1, 2014 to the present. 100 minutes will be additionally discarded from this date, to ensure calculation integrity. If any minute bar is not available in history, a previous minute bar is used in the calculation. If the history is deep, the calculation can take quite a long time. The history for the last two months is calculated first, in order to view the chart immediately. An earlier history is generated afterwards. See the full list of changes implemented in MetaTrader 5 build 1880 for more information on the new version of the trading platform. Download the updated MetaTrader 5 and try its new synthetic symbols features!